This card is for my neighbor's daughter, who recently got married. I wanted to do something special, and followed the instructions for Christina's Butterfly Corner Card on YouTube to make the base. I used white Centura pearl cardstock throughout. 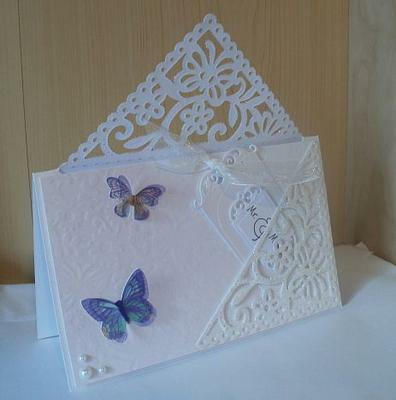 The front and back panels were embossed with a Butterfly Impressability by Spellbinders, and mounted on foam pads. The Butterfly corners were all glittered with white German Glass Glitter (though I wish I'd used Glamour Dust, as it shed a bit!) using spray mount glue by 3M. The sparkly ribbon came from Hobbycraft, I think! The transparent resin rose and the shiny butterflies were freebies with a couple of magazines. I used a Stampendous 'Mr & Mrs' stamp on the label which tucks into the corner pocket on the back of the card. Well this is simply gorgeous and I am so glad that you found the tutorial easy to follow. The result is perfect for a wedding card and I am sure that the happy couple loved it. Using the freebies from magazines is a good idea and I too love the free items that come with my monthly magazine. 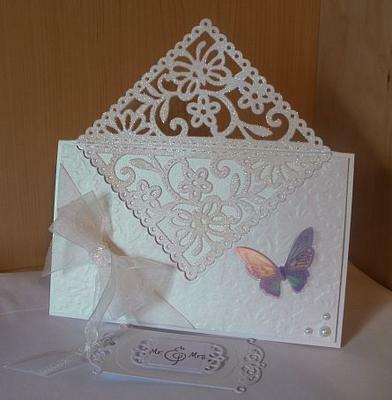 If you would like to make this same card as Maggie has done here then you will find the video tutorial in the Spellbinders Section of Video tutorials in the NavBar to your left. What a lovely card. The simplicity is what makes it so beautiful. What a beautiful card. You have done a brilliant job. I'm sure your neighbour's daughter will be really thrilled with it. that is really a very beautifull card maggie!